In our report released today, we look at how the UK can, after Brexit (and assuming the UK leaves the EU customs union), develop a world-leading trade for development policy. First, we take a systematic look at how rich country trade policies affect developing countries to identify the leading approaches used elsewhere. Rich-world trade policy plays an important role in shaping the opportunities available in poorer countries. CGD’s Commitment to Development Index (CDI, of which the latest 2016 rankings have also just been published) assesses rich-country trade policy in terms of market protection, impediments to imports and other restrictions, and we identify the best countries and their approach across these areas. Clearly, these steps would involve some challenges – in particular, domestically, some industries may seek to maintain the protection the tariffs provide them, and there would be some (small) lost tariff revenue. Internationally, the UK would need to build goodwill as well as being consultative, innovative and persuasive at the WTO to gain acceptance for these steps. 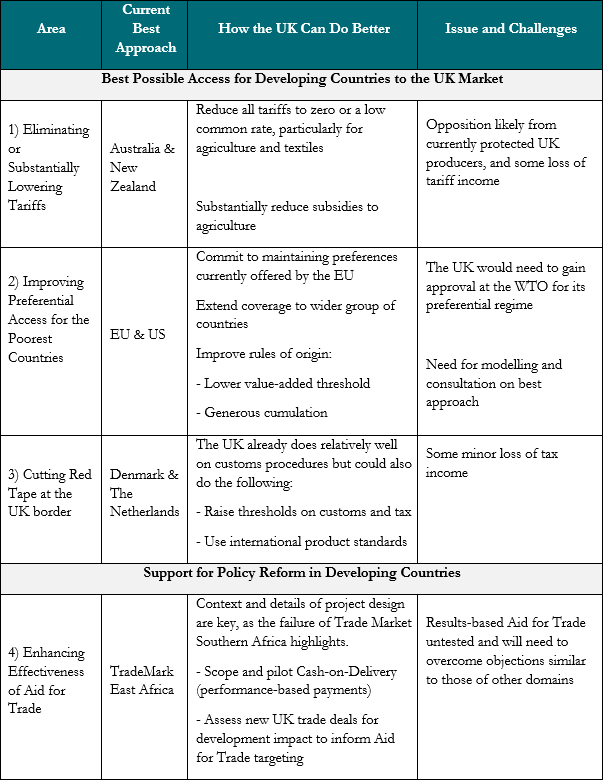 The UK has at least two years before most of these policies would need to take effect, and it should use this time to work consultatively and in genuine partnership with developing countries as partners rather than supplicants. Still, these steps would also benefit the UK. Whilst imports from developing countries are relatively small — some £34 billion (around $41.5 billion), or 6% of the UK’s £549 billion ($670 billion) of imports — consumers and businesses would enjoy lower costs of imports; simplified sourcing of inputs from overseas and enhanced competition and UK productivity. The UK’s departure from the EU will present challenges for developing countries. But the Government can build political support across the Brexit divide for these four steps, which would enable the UK to improve substantially on the approach taken by the EU and other developed countries, benefit UK consumers and businesses, and show UK leadership in establishing a new global standard in trade policy for development. For example, UKIP’s spokesperson on development Lisa Duffy said last week “[what UKIP’s approach to development] believes in more than anything, is encouraging free and fair trade and opening up the UK’s huge consumer market to these [developing] countries” Radio 5 Live 4th January 2017.